The financial management of the FAI has been criticised for decades from various levels within the organisation. The relatively poor treatment of the international squad precipitated an infamous walk-out by team captain Roy Keane during the 2002 World Cup in Saipan, Korea. Ireland’s sporting sector is now being compared to the state’s voluntary sector, which in 2014 became the subject of public outrage over wildly inflated salaries and bonuses paid to the management of charitable organisations at the expense of their supposed functions. Delaney is no stranger to scandal at all. Most recently, he waas previously implicated in the illegal resale of tickets by the Olympic Council of Ireland after the OCI president was arrested and charged with a string of serious offences, including money laundering, in Brazil in 2016. The current controversy centres on a €100,000 ‘loan’ the association received from Delaney in 2017 and is the subject of a parliamentary investigation, which Delaney says he cannot respond to “for legal reasons”. He has previously claimed that he gave the money to the FAI so it could pay an urgent bill -- despite the organisation having an annual turnover of €50 million. His reticence about sharing details of the FAI’s financial dealings is not new. It took six years before he revealed in 2015 that the FAI had been paid €5m to stop a legal action against FIFA, the international governing body of association football, after a controversial World Cup play-off defeat in 2009. Relatively speaking, the €100,000 is a small amount to te FAI executive. But Taoiseach Leo Varadkar has said that the questions “need to be answered” after Delaney stonewalled a parliamentary committee. The board of Sport Ireland, the state body which directs sports development in Ireland, this week it would withhold future funding to the FAI. The body that represents professional footballers in Ireland has also said there is “something rotten” in the FAI. “It is clear that the finances of the FAI need to be forensically examined and the governance of the association completely overhauled,” the PFAI said. It was no coincidence that in refusing to answer questions, the FAI executive cited a legal judgement in favour of Angela Kerins, chair of the voluntary Rehab Group in Ireland, who became disgraced after it emerged her ‘not-for-profit’ organisation for the disabled paid her a salary of a quarter of a million euros per annum. The chair of the Committee Fergus O’Down told the FAI management, best known for swaggering around at sporting functions in bright green blazers, that they needed to start thinking about “regime change”. Former Ireland team manager Brian Kerr called for the entire FAI board to step down and be replaced. 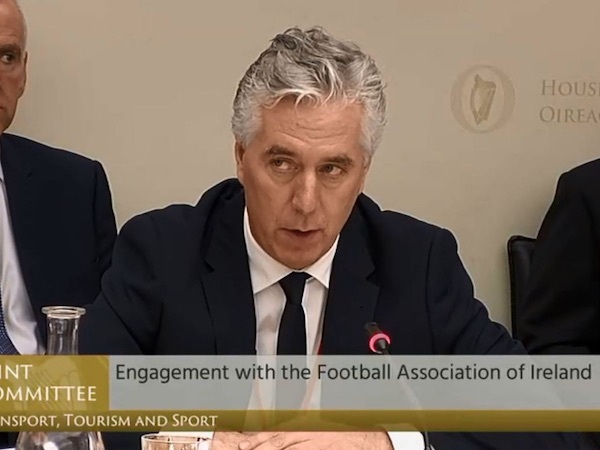 “The FAI had the opportunity today to be open, transparent, humble and truthful,” he said. What we actually got was evasion, arrogance, dodging and weaving, and I would say, large doses of spoofology, when it applies to the questions that they were given. “There seemed to be an intent to give as little information away as possible and to hide behind the various reports. The public wanted transparency.